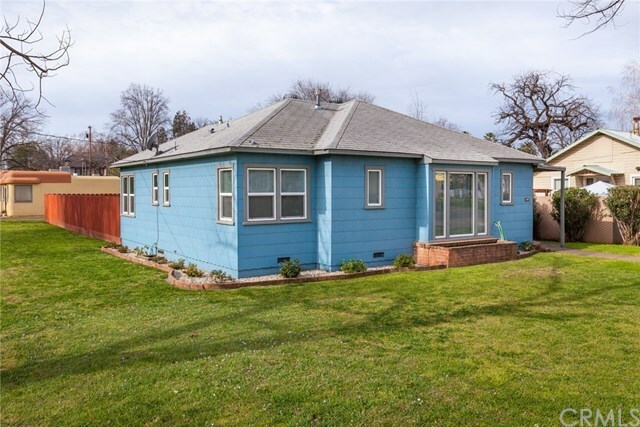 Clean, charming bungalow just blocks from downtown Chico! Situated on a large lot in the Barber District this 2 bedroom 1 bathroom home features original hardwood floors, floor to ceiling windows, and newer paint. The updated kitchen has granite countertops, unique backsplash, refrigerator, gas stove, breakfast bar and a space plumbed for a dishwasher. Other amenities include individual laundry room, nicely sized bedrooms with hardwood flooring underneath the carpet, newer 24,000 BTU/220 volt window AC, separate laundry room, ceiling fans in the bedrooms, detached 2 car garage, and much more! The large yard has a concrete patio which is perfect for entertaining or relaxing. With its walking distance to downtown, Bidwell Park and shopping to its vintage charm, this is the perfect place to call home. Donât miss out on this gem before its gone, call for details.